Every weekday morning, a PVTA van picks up 83-year-old great-grandmother of four Pardelma Hall at her home on Roosevelt Street in Springfield’s North End. For the past seven years, she’s been one of the first to arrive at the Mason Square Senior Center and often one of the last to leave. 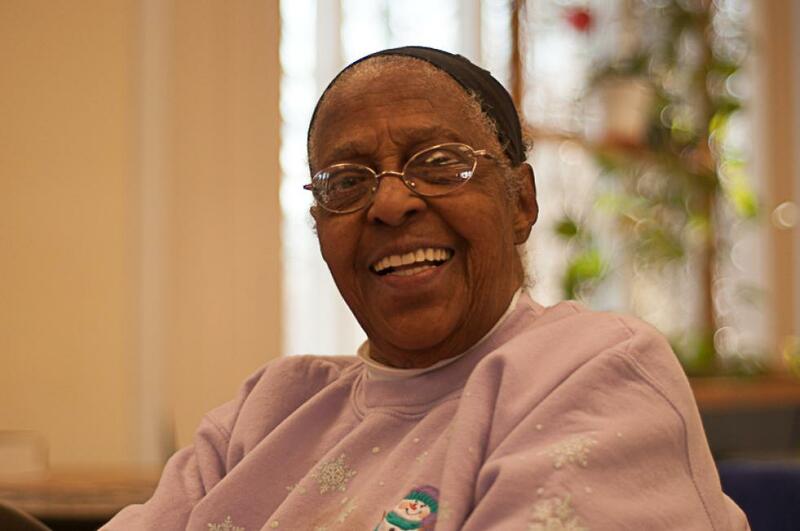 She’s an energetic woman with an independent spirit, and she treats her involvement at the senior center like a job. With her eyesight failing, however, and mobility issues that make taking the bus infeasible, she’s had no choice but to give up driving. She currently depends on the van service as her sole means of transportation. “God knows what I’d do without it,” Hall says. “I’d just have to sit in the house all day.” It’s possible, however, that Hall and seniors like her may be spending more time at home if the Pioneer Valley Transit Authority (PVTA) advisory board votes to make cuts to the senior transportation service. Hall, along with other members of the Mass Senior Action Council and other senior advocacy groups, packed into an advisory board meeting Wednesday to speak out against proposed cuts to the senior transportation service. Among those who stood up to speak was MASC organizer and former union negotiator Patti Williams. “Senior citizens are a very large group that need transportation the most,” Williams said. “The fact that the need is growing … A public authority then needs to expand the service, not contract the service. We’re the public. We’re the taxpayers … I urge you very strongly on behalf of Mass Senior Action Council, please do not, do not, curtail the service of transportation. Do not make us prisoners in our own homes.” The PVTA is mandated under federal law to provide paratransit services to people with disabilities. Though it is not mandated to provide transportation to seniors, the PVTA currently offers them pick-up and drop-off services through its paratransit contractor, Hulmes Transportation Services. Anyone over the age of 60 living in one of the PVTA’s 24 member communities can call to arrange for door-to-door service on one of the paratransit vans for no more than $3.50. The cuts have the potential to reduce senior travel by 60 percent among the more than 500 seniors in the greater Springfield area that utilize the service weekly, according to Williams. “That’s a lot of folks that can’t get to their senior center, medical appointments, shopping, whatever they need transportation for,” Williams said in a later interview. “What does that mean for their lives? It’s going to be a quality of life issue and there’s economic issues in that as well.” PVTA Administrator Mary McInnes says the growing demand due to an increasing senior population has had a negative impact on the overall on-time rate of the paratransit van service. The PVTA’s contract with Hulmes stipulates that the service attain a 95 percent on-time rate. The rate is currently just under 90 percent, according to the PVTA. In order to receive federal funding, the program must achieve the on-time rate set forth in the agreement. MacInnes says that the 95 percent rate was achievable at the time of the negotiation. Though MacInnes said in the meeting that budget shortfalls were not the reason for the proposed cuts, she expressed concerns in a later interview about the cost of the service and the 60-year age minimum, which she says is too low. Many transit authorities, like the MBTA, do not provide any senior van service. The PVTA advisory board’s paratransit subcommittee is currently studying options for addressing the problem with the intent of making a recommendation to the board at their next meeting on March 30. Options under consideration include placing a cap on the number of trips that seniors can take per week or reducing the van service’s hours to seniors, since most of the on-time issues occur during morning and late afternoon peaks. Another involves shifting the responsibility of transporting seniors to local councils on aging. MacInnes says that the PVTA has implemented such cuts in the past and suggests that, if the board does decide to implement a change, it may only be temporary. The board has stated that public hearings regarding the subcommittee’s findings will subsequently be held across the region and that input from riders will be considered before any decision is made. Williams says any of the outlined options would be bad for seniors. While all parties seem to agree that finances are not at the root of the proposed cuts, she’s quick to point out that the expenses for the van service are lower than projected and the income is greater than projected according to the PVTA’s publicly available financial statements. She also slammed the plan to shift responsibility to local councils on aging, saying that those organizations are overburdened and underfunded already. MacInnes stresses that the process has a long way to go before a decision is made and has declined to elaborate on all the options currently under consideration. Though all PVTA advisory board and committee meetings are subject to open meeting law, MacInnes laments that the information reached the public so soon. “In my opinion, the word should not have gotten out until the board could have deliberated more,” MacInnes said. “It’s too confusing to people, especially to the senior riders to hear about this option or that option and then they get all concerned about it. From my perspective, it’s always better to have a recommendation coming out the paratransit committee, have your public hearings on that one option, and then go from there. Otherwise, it’s just way too confusing.” For senior riders like Pardelma Hall, though, who feel that their right to lead active, independent lives would be eroded by any such cuts, it’s easy to see why seniors came out in such droves to speak out so early in the process. Lorraine Babij, a staple at the Mason Square Senior Center and a frequent van rider, is worried by the prospect of a cap on the number of rides seniors could take. “I think it will be a problem,” Babij says. “Some of the ladies here come every day. I mean, that’s 10 trips [a week]. Other Mason Square regulars, like Ruth McCants and Eleanor Fuller, are concerned about how a cut to services might affect their ability to lead active lives. McCants says that taking a regular transit bus would be too much of a challenge for her. Fuller agrees, but rejects the notion that impaired mobility should force them to slow down. Peter Vancini can be contacted at petevancini@gmail.com.